A free guide to campaigning and lobbying, aimed specifically at the charity sector, has been launched by a social enterprise. 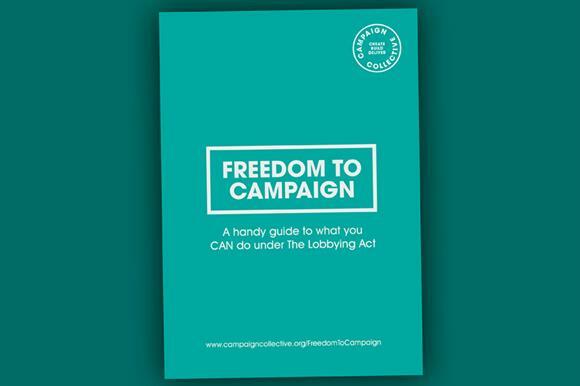 The Campaign Collective, which provides communications and campaigning advice to charities, has today published the Freedom to Campaign Guide, which explains restrictions on campaigning, including measures contained in the lobbying act. The lobbying act requires all organisations that spend more that £20,000 in England or £10,000 in Wales on regulated campaigning in the year before an election to register with the Electoral Commission. Lord Hodgson carried out a review of the act in 2016 at the government’s request and recommended reforms, including reducing the regulated campaign period to four months before an election. But the government rejected the recommendations. In a statement, Campaign Collective said it had chosen to create the guide after the Hodgson recommendations were rejected and a snap election was called in 2017, meaning charities had unwittingly been campaigning in the regulated period. Nancy Platts, co-author of the guide, said the publication was designed to be a simple, plain-English summary of more than 104 pages of official guidance. "As a former parliamentary candidate at two general elections, I saw a marked decrease in the number of small charities and campaigners approach me after the 2010 general election and once the lobbying act was introduced," she said. The publication of the guide comes after research by the campaign support charity the Sheila McKechnie Foundation found that senior staff at a third of charities had become more cautious about campaigning and 87 per cent of respondents said they believed government measures had made the campaigning environment worse. The new guide can be downloaded here.